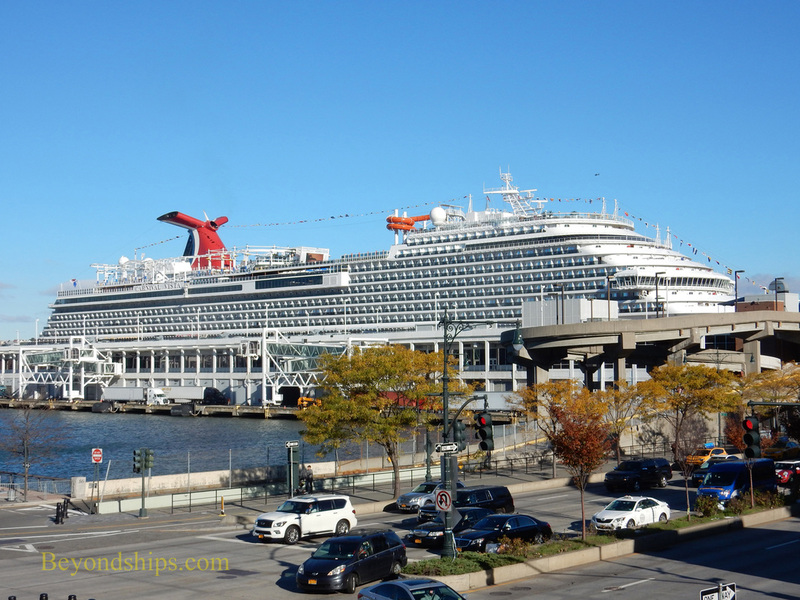 Carnival Vista at New York's Passenger Ship Terminal. ​ After spending a season cruising the Mediterranean, Carnival Vista arrived in the United States for the first time on November 3, 2016. The next day, the official naming ceremony was held at New York's historic Passenger Ship Terminal (a.k.a. The Manhattan Cruise Terminal). The 133,000 gross ton Carnival Vista is the largest ship yet to sail for Carnival Cruise Line. She is not a revolutionary departure from prior Carnival ships but rather an evolution of what has gone before. “This ship is very different. It takes a lot of features that our Carnival guests love and really expands upon it. We have a lot of things that we are doing for the very first time on this ship. The Skyride is a first for us. The first cruise ship brewery in North America - - we've got our brewmaster onboard. The first IMAX theater at sea. An the Family Harbor, our most extensive facility for families. This ship really has it all. It is our flagship. And we are very proud and excited, “ commented Christine Duffy, President of Carnival Cruise Line. Carnival undertook this project in partnership with Operation Homefront and entertainer Carrie Underwood. Ms. Underwood performed a concert for the military families in Vista's Liquid Lounge theater. In keeping with the military theme of this ceremony, Carnival selected Captain Deshauna Barber (USAR) as the godmother of Carnival Vista. Captain Barber was the first woman serving in the U.S. Military to be selected as Miss USA. (2016). “Deshauna is the ideal candidate to serve as Carnival Vista’s godmother, embodying the spirit of commitment and sacrifice of those who protect our freedoms each and every day.” Ms. Duffy noted. ​Above: Christine Duffy, President of Carnival Cruise Line. Above: Carrie Underwood. On cruising: "It is all about making memories. Whenever you are on vacation or on a boat in the ocean and in the sun, it is all about making memories."